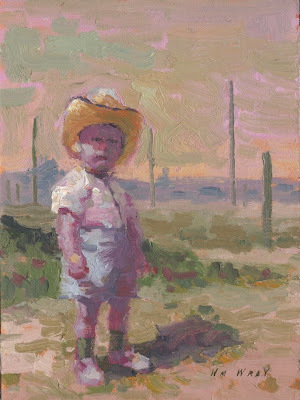 Bakersfield 12x16 oil on linen. When I went to Bakersfield awhile ago to drop off my paintings for the show, I realized I had not done a panting that really reflected one of the main industry's so I did this the same night I got back and will hang it a half hour before the prieview starts. Oh and a Ashy little bird told me the new Sparrow book will be out in December. Hope it makes it to the show...Bird toes crossed. I can't help but thinking of a self-portrait of Van Gogh here. I like the textures! Jack Sparrow the "Boy" #9, before the pirate years? Congrats on your new book and the success of the new show(s) and of course the new painting. Young caballero in a saguaro patch is a trippy scene and the orbs are digg'n it. I've mentioned many times your ability to use pink (one of my favorites) in a dramatic way and kick up the interest level a few notches. Your ablility to define form in a painterly way and explore color nuance as you do is extraordinary. Whoa, this painting is RAD! Bill, I often wonder what the painting looks like before you take to the thick paint for the final strokes of afterthought. I'm with others on the self-portrait thing also, is this you as a youngster? Hey Bill, I am a big fan and am "tagging" you in a game of blog-tag. Consider it a poke of utmost respect and admiration. Rules are on my blog - enjoy. I love, love, love your work. Astro Motel sounds like a place I'd love to check out--at least, as long as it's still open. I don't know when I'll get the chance to see some of your originals so I greatly look forward to the book. Congratulations! I wish you well with the upcoming show. Many things are going on and I wish you good luck for that. I dig the boy and the colors you used for the painting which makes it even more creepy. Astro Motel..love it! If you are ever in Pendleton, Oregon in the very old downtown there is a Mortuary across the street from the Travel Lodge Motel. Go there, see neon sign, (it is the Mortuary's, not the motel!) It cries to be painted by you! 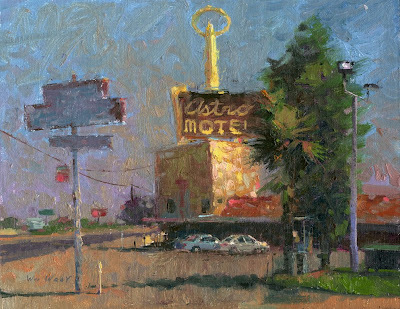 Love the Astro Motel and the beautiful warm light and the isolated sadness. Now it's my new desktop image. Thanks and best wished for your Bakersfield show. Hey, hey! 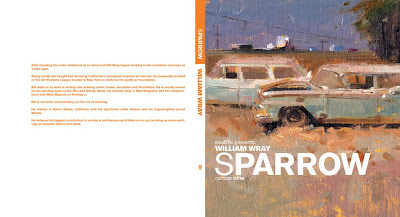 Very cool about the Sparrow book. That's a sweet series. Really nice work! 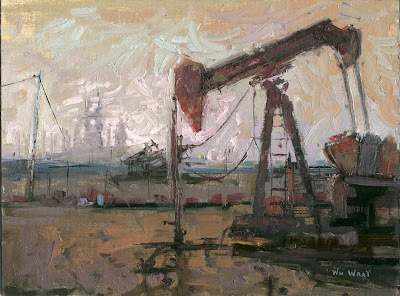 I especially like the oil rig! great, you are a genius bill. As has been the case lately I've gotten so far behind on my replies I hope eveone will forgive me. the show and workshop when well. Both were well attended and I post some photo's soon.